Everything was perfect! Great view, 5 minute walk from Oia city center where the blue domes are located. The staff was amazing and always attentive. This was the best customer service I’ve ever received in Europe. Super friendly guy working in the reception. He was fantastic. He will help you with anything you need with a smile. Rooms were nice and location was close to everything. The friendly attitude of everyone at the hotel, especially Dimitris was amazing. The location is excellent - barely 20 mins by foot to Oia Castle. The food was really nice, especially enjoyed the Souvlaki, Santorini Fava and Portokalopita. The staff were amazing at providing us with information and hospitality to make our stay great! The breakfast was also really good! Anemomilos is the best hotel experience I have ever had. Dimitris gave more than exceptional hospitality. He made sure we had an amazing stay in Santorini. We booked a cruise and he called to verify with the company and made sure they picked us up in front of the hotel. Spiros and his restaurant staff were extraordinary. The food was delicious too! We had several meals here including the breakfast. The housekeeper made sure our linens were fresh daily and she made the bed neatly on a daily. She always swept and mopped and made the room smell lovely. The entire staffs immaculate service was worth more than any view I experienced at the Airbnb’s I stayed at prior in Santorini. We will be returning. Thank you all so much!!! Clean, nice staff, very good location. The welcome drink is so great! Perfect location, quick walk to everything. Friendly staff, maybe the friendliest I’ve ever encountered. No problem parking if you’re driving. Comfortable room and bed. Everything! 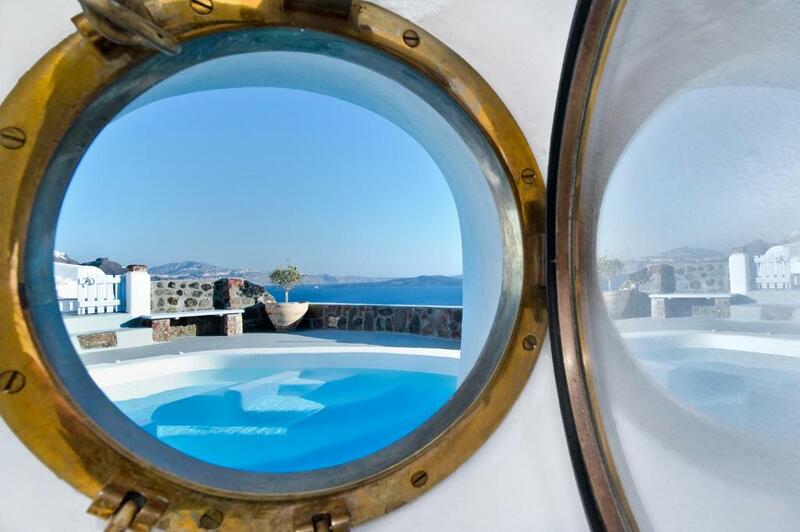 Not far from the center of Oia but the price is more affordable. Staff is super nice and views are spectacular. A cosy stay at Anemomilos. Compliments to Dimitris at the front desk who welcomed us and made us feel comfortable. Provided information about oia.overall a very nice stay. Oia is something unique and totally recommended. 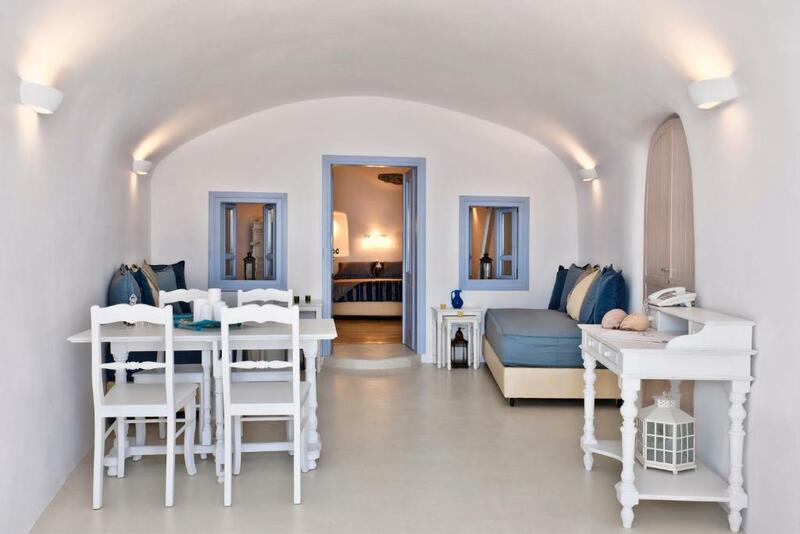 Lock in a great price for Anemomilos – rated 8.9 by recent guests! 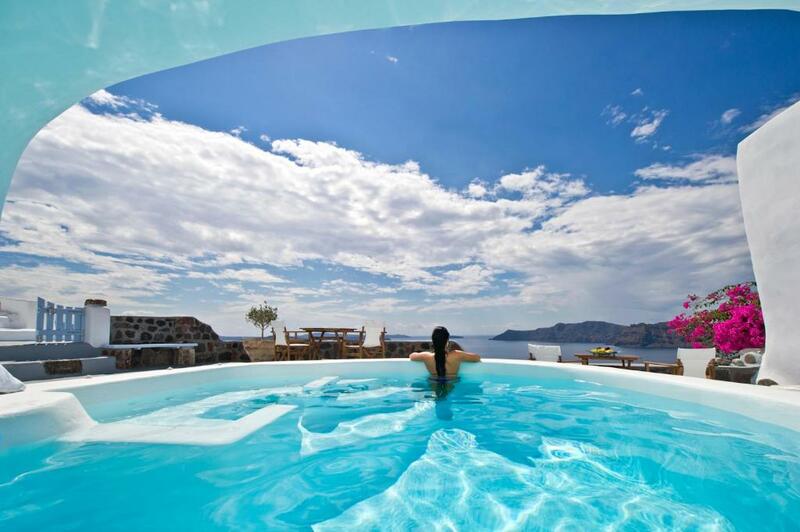 Anemomilos Hotel is in the town of Oia, a popular vacation destination, due to its spectacular view of the volcano and the Aegean Sea. Anemomilos Hotel facilities include a restaurant, a seasonal swimming pool, children’s pool and a TV room. A parking area and a lounge are also available. Anemomilos Hotel consists of 13 spacious, tastefully furnished hotel rooms, apartments and studios. Most open onto a porch that overlooks the Aegean Sea. Each unit includes air conditioning, Wi-Fi internet and a flat-screen TV. A convenient location next to a public bus stop makes Anemomilos a perfect base to explore the island. 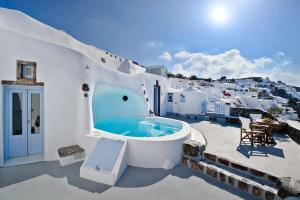 뀐 Located in the top-rated area in Oia, this property has an excellent location score of 9.2! When would you like to stay at Anemomilos? Open-plan accommodations with Greek-island style decoration. Located 328 feet from the main building, this traditionally decorated villa has beautiful Caldera views. Cycladic-style studio with outdoor hot tub, kitchen and living room. This studio features a balcony, hot tub and tumble dryer. This apartment has a balcony, tumble dryer and seating area. This apartment features a balcony, seating area and tumble dryer. House Rules Anemomilos takes special requests – add in the next step! Cash Anemomilos accepts these cards and reserves the right to temporarily hold an amount prior to arrival. Anemomilos accepts these cards and reserves the right to temporarily hold an amount prior to arrival. Please note that the swimming pool operates from the 1st of May and it is not heated. Please note that breakfast area, pool, restaurant, reception and parking are 500 feet from the apartments, at the central building of Anemomilos. Please note that breakfast is a la carte in March, April and October, and in buffet style from May until September. Very friendly and helpful staff. The restaurant was excellent! Great food and nice staff. Dimitri at the front desk was wonderful as well and gave us lots of good tips. Thanks for a wonderful time! 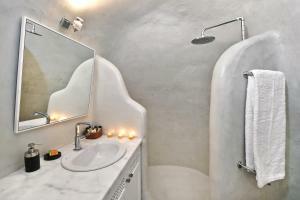 I absolutely loved everything about this property but if I had to pick one thing I dint like, it was their desert wine. Huge, spacious room and bathroom. Plenty of parking. Great breakfast with an amazing spread of local and international cuisine. Amazing pool, hot tub was the icing on the cake. The room had a sink, utensils and hot plate too. 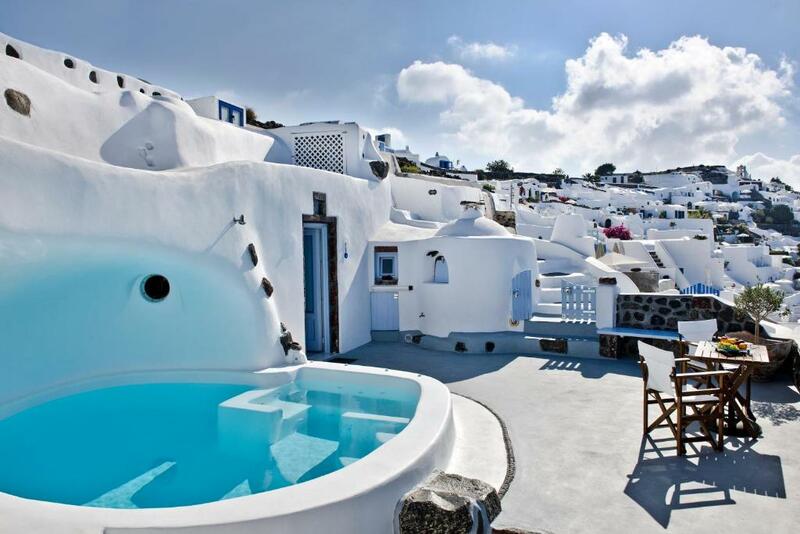 Wish I had more than a day to enjoy Santorini and this beautiful property. The service was amazing! The hotel was better than I expected. It was a short walk to the spectacular sunset view. The staff was the best. The restaurant was so delicious. The staff there was very friendly and helpful with everything and even booked a tour for me. Hard beds, no fresh water provided, no laundry facilities nearby. Nice family hotel and traditional restaurant located in very good area of Oia. The stuff was smiley and ready to help anytime. I’d recommend this hotel and restaurant to anyone and definitely, I’d like to be accomodated in this hotel again. Absolutely loved Anemomilos!! We stayed in one of their gorgeous cave villa with stunning views over the Caldera! Villa had everything we needed even binoculars! Apartment was well appointed with lovely furniture, comfy beds & great shower. A leisurely 10 min stroll to the marble pathed central area of bars & restaurants. Right next to the hotel is a great mini market perfect for beer, water, ice creams & fresh bread. The breakfast in Anemomilos is superb too. Lovely, traditional homemade Greek breakfast items & changed every day we stayed. The Restaurant is fabulous simple, tasty & reasonably priced authentic Greek food. The staff are all so friendly & obliging too. Especially Dimitris!! The beds were a bit firm for our taste. Tasty breakfast with nice seaview. Everyday cleaning room and cleaned towels. Free privat parking lot at the hotel. Wifi signal was a bit weak in the room. Since i have back pain, i felt the mattress were too seasoned and felt slightly uncomfortable. The location is perfect. Bus stop is just next to the hotel. And it is walking distance to Oia, which is a great factor as we could walk to Oia in the wee hours of the morning to catch the sunrise. Also we enjoyed sunset almost everyday in Oia - we don't have to depend on buses schedule. I think they gave us a room upgrade. Even though the room lack some amenities such as kettle or iron, a simple call to the front desk and they will provide you with the things you need! We were spoilt for choices at the breakfast buffet, a lot of things to choose from and they change the menu everyday.The highlight of it was the warm friendly hospitality of the hotel staffs especially the front desk guy Dimitris. They helped us a lot and gave us a lot of information regarding our trip. He also checked our ferries on our last day whether they have delays due to the weather. We would definitely come again next time! Massive room. Friendly staff. Clean. Great restaurant. Family friendly. The toilet was a little small and smelt a little odd. The room was very comfortable.The staffs were very friendly and welcoming.Excellent breakfast. Some little construction works nearby. The amazing view, the jacuzzi and the location. 5min to center of oia and sunset.